Envelope Stiffeners, Envelope Inserts, Animal Heaters, Pet warmers . Challoner Marketing have been producing flyweight stiffeners since 1981 and now supply an extremely diverse range of customers including photographers, picture libraries, the legal profession, the NHS, the Royal Mail, numerous charities, certification companies, book publishers, computer departments and graphic designers. Flyweight stiffeners are made from twin-walled fluted polypropylene board and add negligible weight to any item being posted. They are most commonly used as envelope stiffeners but there are a wide variety of applications and many benefits. For maximum protection and added safety and security, we can provide cross-grain strength by cutting two sheets in opposite directions. Unlike cardboard, flyweight stiffeners are completely waterproof and therefore offer greater protection to the items you have chosen to send or store. Stiffeners are incredibly strong, offering excellent protection to your photographs, certificates, x-rays, trannies, books, computer disks......in fact flyweight stiffeners are strong enough to cope with most packaging, mailing or posting jobs. Flyweight stiffeners are Versatile. They can be cut to any size or shaped to fit a particular item. 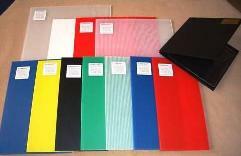 Use them as filing dividers, drawer liners, crate bases. Flyweight stiffeners are made from twin-walled, fluted Polypropylene board and add negligable weight to your letter or parcel, thus keeping your postage costs to a minimum. It is much more cost effective to post items using flyweight stiffeners than expensive board backed envelopes. For stock sizes we usually despatch within 48hrs, but endeavour to complete deliveries in 72hrs (Mon-Fri) from the receipt of order anywhere in the UK. Please note all products are plus VAT (at the current rate), which will be added to your basket on check out.